Not long ago, an official from the former Obama administration warned that the US is the most vulnerable nation to cyberattacks. While the Trump administration appeared to be making some efforts to redefine the role and authority of the CISO, something mind blowing happened in the meantime: the White House fired the cybersecurity coordinator on the National Security Council in May. This came as a major shock, since cyberattacks are forecast to increase in coming years, and cybersecurity should be a top priority for any federal security team. Would the firing make the US even more vulnerable? While security experts tried to get over what had just happened, the US Department of Justice presented clear evidence that what had been known as the hacker Guccifer was actually a meticulous cover for bitcoin-funded Russian intelligence operatives. According to the department’s indictment, 12 Russian intelligence officers were arrested for the attacks on the DNC, the DCCC and Hillary Clinton, with 11 criminal counts overall. The suspects “were officials in Unit 26165 and Unit 74455 of the Russian government’s Main Intelligence Directorate,” said the DOJ. “All twelve defendants are members of GRU, a Russian federation intelligence agency within the Main Intelligence Directorate of the Russian Military,” reads the press release. “The object of the conspiracy was to hack the computers of US persons and entities involved in the 2016 US presidential election, steal documents from those computers, and stage releases of the stolen documents to interfere with the 2016 US presidential election,” the indictment said. 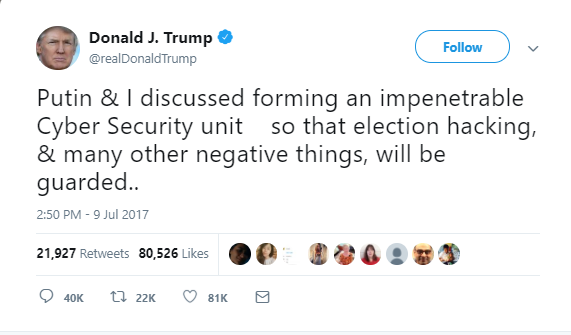 Just this week, Donald Trump met with Russian President Vladimir Putin in Helsinki and, in spite of the DOJ’s evidence, Trump instead is looking at accepting Putin’s suggestion of a joint cybersecurity team to investigate the cyberattacks. Not only did he cast doubt on a high-level forensic investigation, but this could make room for major vulnerabilities in the US infrastructure, exposing it to fileless malware.